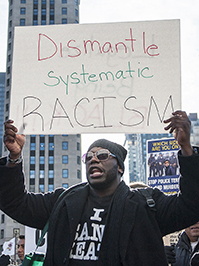 Race-centered conflicts in several U.S. cities have led to the strongest calls for policy reforms since the turbulent civil rights era of the 1960s. Propelled largely by videos of violent police confrontations with African-Americans, protesters have taken to the streets in Chicago, New York and other cities demanding changes in police tactics. Meanwhile, students — black and white — at several major universities have pressured school presidents to deal aggressively with racist incidents on campus. And activists in the emerging Black Lives Matter movement are charging that “institutional racism” persists in public institutions and laws a half century after legally sanctioned discrimination was banned. Critics of that view argue that moral failings in the black community — and not institutional racism — explain why many African-Americans lack parity with whites in such areas as wealth, employment, housing and educational attainment. But those who cite institutional racism say enormous socioeconomic gaps and entrenched housing and school segregation patterns stem from societal decisions that far outweigh individuals' life choices.